The Palestinian Prisoners’ Society (PPS) has reported that Israeli soldiers abducted, on Wednesday at dawn, eighteen Palestinians from their homes, in several parts of the occupied West bank. The PPS stated that the soldiers invaded and ransacked homes in the al-‘Isawiya town, in Jerusalem, and abducted Hamad Shalabi, Majd Marwan Dari, Ahmad Dirbas and Mohammad Ayman Obeid. In Qalandia refugee camp, north of Jerusalem, the soldiers abducted Odai Wafa Mezher, from his home, while Tawfiq al-Bassa was abducted from his home in the al-‘Ezariyya town, east of Jerusalem. The PPS office in Hebron, in southern West Bank, said the soldiers also searched many homes and abducted eight Palestinians, identified as Nadim Moheeb Jawabra, Hisham at-Teety, 14, Khaled Abu Salem, Mohammad Hasan Badawi, Hatem Sabarna, Odai Emad Tawayha, Nidan Nawwaf Sharif, in addition to Hatem Sabarna, from Beit Ummar town, north of Hebron, who was taken prisoner at the Container Roadblock, south of Jerusalem. In Bethlehem, the soldiers searched homes and abducted Fadi Halawa and Mohammad Jamil Abu Sarhan, and assaulted a blind man in his own home. In Nablus, in northern West Bank, the soldiers abducted Mohammad Nasouh Eshteyya, from his home, and injured ten Palestinians, including a journalist. Another Palestinian, identified as Rafe’ Ekbariyya, was taken from his home in Tulkarem, in northern West Bank. 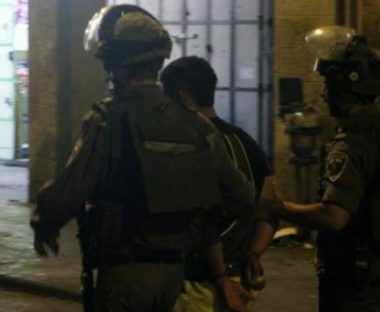 It is worth mentioning that, on Tuesday, the soldiers abducted twenty-two Palestinians from the courtyards of the Al-Aqsa Mosque, in occupied Jerusalem, after dozens of soldiers invading it and assaulted many worshipers. One of the abducted Palestinian is Nasser Qous, the head of the Palestinian Prisoners’ Society in Jerusalem.